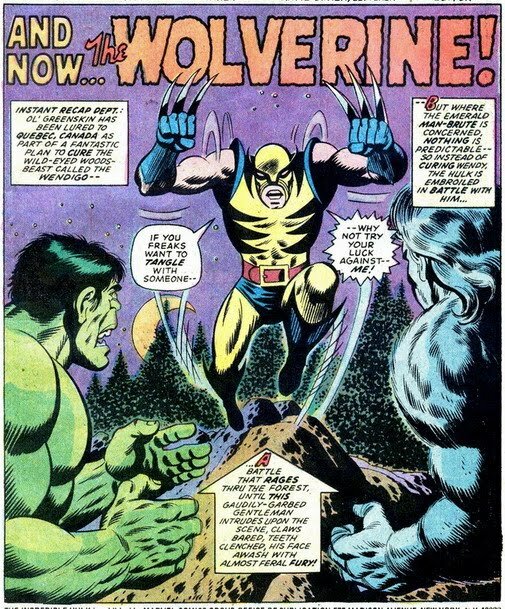 Wolverine, the pint sized mutant from Canada, has been a very popular since he was introduced in 1974. He has been made even more popular in recent years by Hugh Jackman, who's played Wolverine in the X-Men and Wolverine movies by Fox. For the record, this is actually the second appearance of Wolverine in comics. 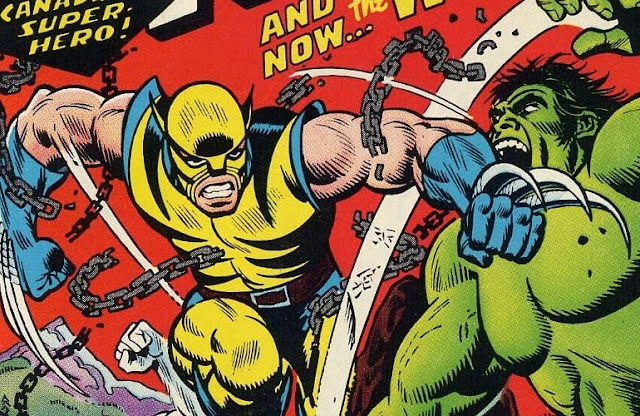 His first appearance is in the issue prior to this one, Incredible Hulk #180. He is only shown in the last panel of Hulk #180 so it is only considered the first cameo appearance. What constitutes a cameo, brief or full appearance is beyond me, but this is how the industry is labeling them at the moment, so who am I to argue. As most of you know, Wolverine is a product of the Weapon X program. It was in this program that he had his bones and claws fused with Adamantium. Adamantium is one of the strongest medals known in the Marvel Universe. It is second only to Vibranium, the medal that Captain America's shield is made from. Also, it's because of Wolverines ability to heal extremely fast that he is able to survive the procedure. Those facts about his origin aren't revealed in this issue though. 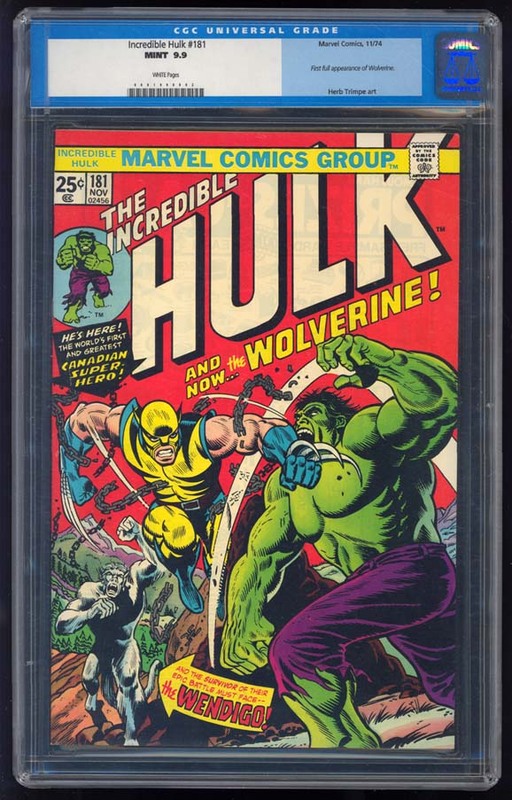 As of this writing, there are an astounding 8,315 copies of Hulk #181 in the CGC census. That's not counting copies from any of the other grading companies. A lot of the copies graded are high grade 9.0 or above, but there is only one graded at a highest 9.9. 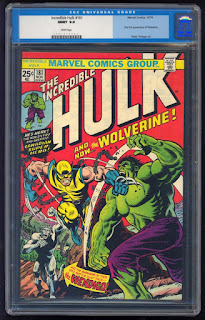 This copy sold for $150,000 at ComicLink.com in 2011. It jumps up to 99 copies graded a 9.8. In all, there are over 2,000 copies graded 9.0 or above, but some of those are restored copies. The grade with the most copies is 8.0. There are a total of 774 8.0 copies. Even considering that there are almost 8,500 CGC graded copies out there, demand is still outweighing supply at this point. There are a lot of copies out there and I'm sure you will be able to find one online or at a convention, but it's not going cheap, since Wolverine is so popular and such a fan favorite. As you can see in the chart to the left, even the average sales of mid grade 6.0 copies are jumping past the $1,000 mark on eBay. There have also been a few 5.5 copies selling over that mark. Like I said, demand is high. You can take a chance and snag a copy at the prices that they're at and hope that demand and the price increases, or you can wait and see if the demand is going to fall. If the demand goes down and people start to lose interest, then the prices will come down too. I'm not expecting demand to go down anytime soon but, I'm going with the latter anyway, unless I can find a really good deal somewhere. And, like always, you can try to find a raw copy and send it in to be graded, but that's always a risk, especially when you have to shell out that much money for a copy.